The death toll from Tropical Storm Florence rose to 41 even as cleanup was well underway and leaders in impacted areas prepared to ask the federal government for what could amount to billions of dollars in aid. South Carolina Gov. Henry McMaster estimated Friday that his state has suffered $1.2 billion in “financial impact” from the storm, according to a letter he sent to the state’s representatives in Congress. North Carolina Gov. Roy Cooper called on state lawmakers to convene a special assembly on storm damage before he puts in a request for cash from Washington. “As I’ve traveled around the state surveying damage and meeting with people who have lost everything, it’s clear that the destruction in eastern North Carolina is historic,” he said in a statement. Utility Duke Energy said Thursday that 49,000 power customers affected by the storm were still without power. Electricity was restored for nearly 1.8 million addresses that went dark during the storm and its subsequent flooding, according to a statement. 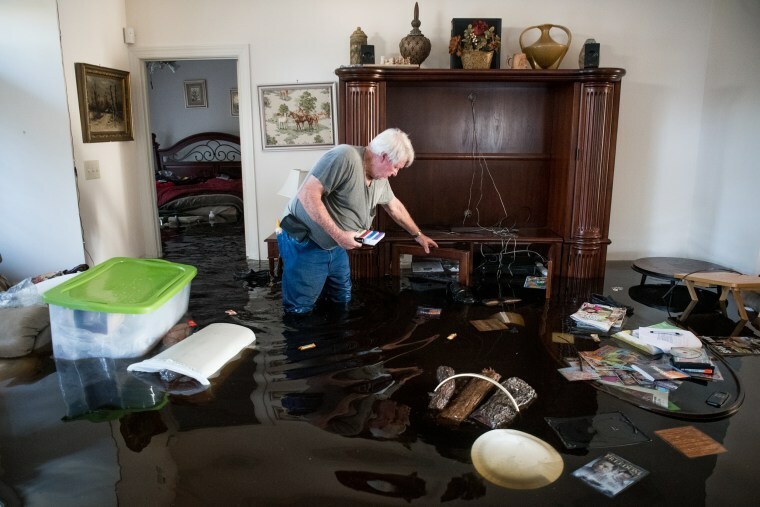 Most of those still without power were in some of the hardest-hit areas of North Carolina, including coastal and inland areas that experienced historic flooding, multiple road closures and significant structural damage, the utility said. Of the 41 fatalities, there were 31 in North Carolina, nine in South Carolina and one in Virginia. Even with cleanup underway in many sections of the Carolinas, flooding concerns have not subsided. Continued flooding from the Cape Fear and Lumber rivers will likely keep 16 sections of Interstate 40 and Interstate 95 closed for another week or longer, North Carolina Transportation Secretary Jim Trogden said. Cooper said more than more than 700 roads remains closed, and vehicle travel in many of the state’s eastern counties was discouraged. In Georgetown County, South Carolina, where much of the floodwater will reach the sea, authorities are still preparing for disaster. County Administrator Sel Hemingway said a worst-case scenario would include evacuation for more than 10 percent of the county’s 61,000 residents. Authorities there planned to hand out 15,000 sandbags. Elsewhere, looters presented another threat. Authorities in North Carolina have made more than a dozen arrests and say they’ve recovered dozens of pairs of shoes, clothing and other items with security tags still attached. The National Weather Service on Thursday night tracked the remnants of Florence to the coast off Massachusetts. Friday marks a week since the storm made landfall near Wrightsville Beach, North Carolina.